world's only unfrozen caveman superhero. How cool is that? Rescued after eons on ice by three buxom teenagers (Brenda, Taffy and DeeDee), Cavey (as the three called him) and his female coterie traveled around 20th century America solving mysteries. (His producer, Hanna-Barbera, was doing a lot of Scooby-Doo knock-offs at the time, from The Addams Family to Josie & the Pussycats.) They were aided by his awesome super powers, which included extraordinary strength, flight, a club that could be transformed into any number of convenient devices, and the ability to pull virtually anything out of his fur. 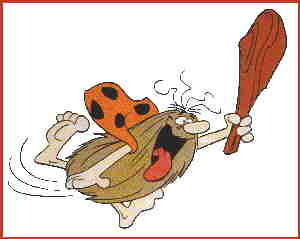 Captain Caveman's voice was provided by Mel Blanc, voice of Tweety Bird and Yosemite Sam, to name only a couple of relatively minor examples. Brenda, Taffy and Deedee were voiced by Marilyn Scheffler, Laura Page and Vernee Watson, respectively. Cavey and the girls began on Sept. 10, 1977, in one of the back segments of Scooby's All-Star Laugh-a-Lympics (a show that featured dozens of earlier Hanna-Barbera characters, from Quick Draw McGraw to Yakky Doodle). Three years later they graduated to a show of their own. Captain Caveman & the Teen Angels debuted on ABC on March 8, 1980. The last new episode aired on June 21 of that year. Including earlier segments, there were 40 episodes. Today, both versions of Captain Caveman can be seen in reruns, but only occasionally and usually in out-of-the-way cable venues. Text ©2001-08 Donald D. Markstein. Art © Hanna-Barbera.